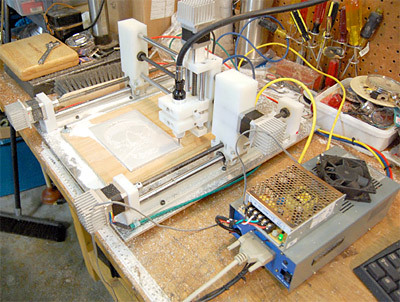 I ran the first machining job with my newly operational Lumenlab Micro CNC robot (did you hear the champagne cork pop?). I say newly operational, since I won’t consider this thing “finished” for a long time, if ever. I anticipate fitting new tools to the machine to do different things for years to come. Lithophanes were a popular way to hide girlie pictures in the bottom a of gentleman’s tea cup around the end of the 19th century. An image would be molded into the porcelain in the cup so that only when held up to a light would the picture be visible. 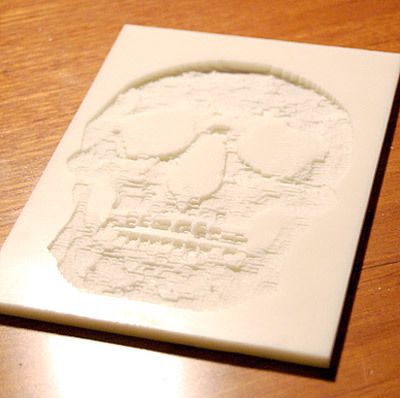 I “lithophaned” an image of a skull into a piece of corian. When viewed under normal front lighting, it sort of looks like a distorted C-3P0 face, but when held up to a light source, it is transformed into a skull. The open source, EMC2 machine controller software that I am running comes with a cool program that converts a grayscale image into a machining tool path (g code) program. Some of you will no doubt remember the CNC vanity jack-o-lantern that Grayson Sigler made last year with this little freeware gem. Here is a video of the machine at work. 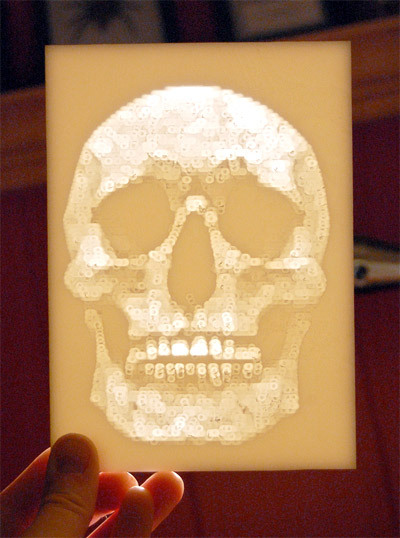 But be warned, unless you are deeply interested in engraving, it is a little bit like watching paint dry. I can’t stop watching it. This entry was posted on Wednesday, June 24th, 2009 at 8:32 pm	and is filed under Art, Debris, Electronics. You can follow any responses to this entry through the RSS 2.0 feed. Both comments and pings are currently closed.